Science brochure – Sponsorship synthetic biology. 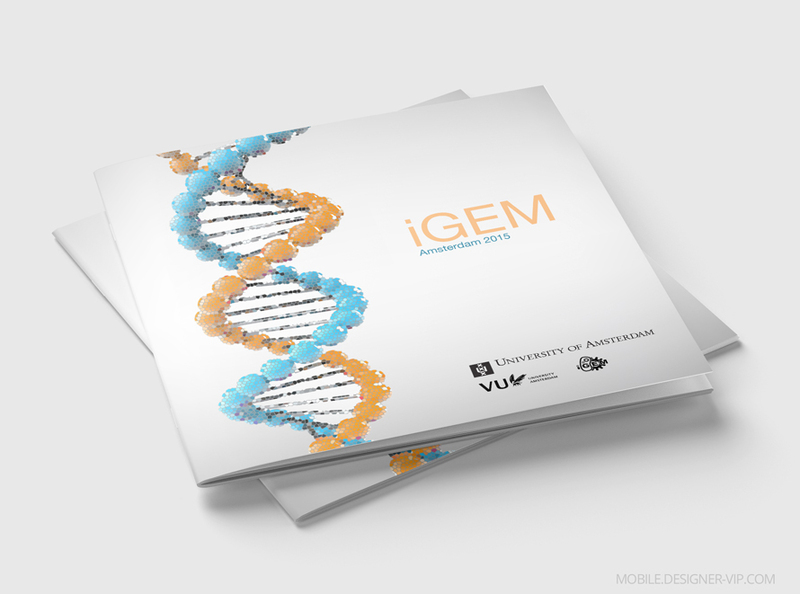 This brochure will provide background on synthetic biology, our project, who we are, and how helping us can benefit you. We hope you’re as excited about the future of synthetic biology as we are! With your help, we can blow minds. “We live in a remarkable time. Ever since the 70’s, we’ve been able to read, interpret and manipulate DNA – the programming language of life itself. Now, backed by the transformation of biology into an information science and Moore’s law, we have complete lists of the basic DNA components that constitute various micro-organisms, accessible from any web browser in the world; we also have genetic building blocks that are standardized and cheap, allowing modular use with predictable outcomes; and we have computer aided design, analysis and modelling to speed up progress even more. Together with rapid gene synthesis and sequencing technologies, engineering life has become both more accessible and creative, resulting in a synthetic biology revolution poised to transform industries. In practice, synthetic biology often involves the design of genetic circuits – sets of interacting genes that perform a desired task – and the insertion of these designed circuit into living cells. As such, microbes can be programmed to produce fuels, smell like banana’s, or sense and break down toxic compounds. It has opened up a whole new playing field for solving problems and creating knowledge – and we’re remaking ourselves and our world while at. It all started in 2004, with MIT organizing the first competition between five university teams in the United States. Fast forward ten years, the competition has grown from five teams to over 245, all of which come together at the Giant Jamboree at MIT to present their projects. Over the course of several months before and during the summer, students devote their waking lives to design and build biological systems with significant social impact and operate them in living cells. The created genetic parts are standardized and submitted to the BioBrick registry, where they can be used and expanded upon byother teams. On top of the scientific research, students reach out to inform the public about the implications and potential risks of their work. They also engage with companies, the government and academia to obtain sponsorship for the costs of participating in company, including registration fees, laboratory work, DNA synthesis, and travel costs. And although company is an excellent teaching tool – giving students a chance to do real, cutting-edge science – it has produced many significant advances in synthetic biology, with many projects resulting in publications in major journals, startups, and new methodologies adopted by labs worldwide. The problem Our economy depends on fossil fuels. For decades, this has fueled the incredible progress of our world – but not without the massive cost of geopolitical instability and global warming. With worldwide energy demands expected to double in 2050, the quest for clean, renewable energy is one of mankind’s most important modern challenges. A bio-based economy – one that meets its energy and production demands by leveraging biotechnology – is often posed as a necessary alternative. We can already obtain fuels from biological materials, such as plants or genetically engineered microbes. The carbon-fixing activity of these organisms essentially makes using these fuels carbon-neutral. But as good as this sounds, there is simply not enough arable land to rely on plant biomass for fuels or feedstock for other microbes to produce fuels. Even algae, powered by sunlight and CO2 alone, produces inadequate yields. Needless to say, associating with two of the top scientific institutes in the Netherlands, supporting the most prestigious and anticipated event in the life sciences, and helping a team of young, ambitious students eager to work on a project with real social impact enhances your organisation’s image in many ways. Every year, our team attracts tons of publicity for its innovative projects and success stories. Our sponsors can benefit directly from this publicity. Company is also highly valued by biology, engineering, chemistry and computer science students for its innovative and entrepreneurial nature. Our team will conduct extensive social outreach, attract media attention, and organise multiple events for students and the general public. A sponsor agreement will therefore present your company as an interesting and progressive employer for some of the most talented students of our faculties. I have a brochure (around 10 pages) of which the design is slightly flawed. Also I have made sketches of a few amendments that I need implemented on a number of these pages. Possible I can provide all required source files for this. If you need a multipage brochure designed for your company our studio can help.